Sherfane Rutherford of Guyana Amazon Warriors hits 6 during match 30 of the Hero Caribbean Premier League between Guyana Amazon Warriors and Trinbago Knight Riders at Guyana National Stadium yesterday in Providence, Guyana. 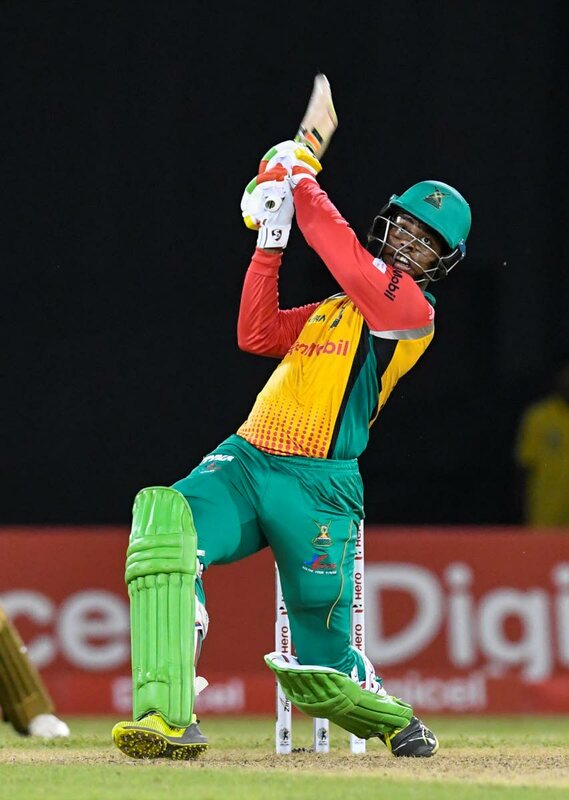 GUYANA Amazon Warriors ended a six-match winning streak by the Trinbago Knight Riders last night to squeak into the top two as the preliminary round of the Hero Caribbean Premier League (CPL) ended at Providence Stadium in Guyana. Guyana, facing a TKR team resting a couple of their top bowlers such as pacer Ali Khan and off-spinner Sunil Narine, comfortably won by six wickets after restricting their rivals to a modest 154 for seven in their 20 overs. The victory saw Guyana (12 points) leapfrog the Jamaica Tallawahs (12 points) into second spot with a better net run rate. TKR, on 14 points, had already sealed top spot in the group. The result sets up an intriguing qualifier tomorrow at the same venue between the same teams but with Guyana suddenly with bubbling with self-belief and boasting the backing of a cricket-crazed nation in their backyard. The Knight Riders, with a full strength team, easily took down the Amazon Warriors, last Friday, at the Queen’s Park Oval, but they just needed to look around to realise they were far away from home. Away games had been no problem for Dwayne Bravo’s team the entire season except for last night. The defeat was their first loss away from home for the campaign and Guyana suddenly look extremely dangerous on home soil. Shimron Hetmyer, the youngest player to score a CPL century earlier this season, blazed a half-century and the 21-year-old dynamite looks unstoppable once his fuse is lit. Hetmyer lashed a scintillating 59 with three boundaries and five maximums. Sherfane Rutherford also announced himself with a lightning knock of 42 from 13 deliveries including three straight sixes off Nikita Miller in the 11th over – the last being an audacious reverse sweep. TKR skipper Dwayne Bravo did not go unscathed, conceding 36 in his two overs with Rutherford manhandling him as well as the youngster flirted with the record for the fastest CPL 50. At the top of the order, South African Cameron Delport gave them the perfect start to the chase with 31 off 27 including four boundaries and two sixes. TKR, the two-time defending champions will need to regroup quickly for Tuesday’s qualifier. Both teams have two chances to qualify for the final. Earlier, Guyana took control of the match in the Powerplay, reducing the visitors to 23 for three in the sixth over. Openers Colin Munro (6) and Brendon McCullum (9) fell cheaply and South African Colin Ingram, playing his first match of the CPL as a replacement for Chris Lynn, failed to make an impact. The left-hander was out caught by Jason Mohammed off Chris Green for four. Denesh Ramdin and Darren Bravo sought to repair the innings and too the score to 77 before Ramdin became Rayad Emrit’s first scalp to be dismissed for 32. Darren was joined by his brother Dwayne and the pair pushed the score to 109 before Dwayne departed for 14. Kevon Cooper, with a brilliant 30 – three fours, three sixes – gave TKR a late push as they got to 154 for seven. Summarised Scores: TRINBAGO KNIGHT RIDERS 154/7 (20 Overs) - Darren Bravo 42 not out, Denesh Ramdin 32, Kevon Cooper 30, Sohail Tanvir 2/36, Rayad Emrit 2/25 vs GUYANA AMAZON WARRIORS 155/4 (14.1 overs) - Shimron Hetmyer 59, Sherfane Rutherford 42. Reply to "GUYANA END TKR STREAK"